The post election violence will remain an issue for yet another year as the deadline to form a local tribunal has been extended yet again. What this means is that the wounds will remain raw and those who committed the most heinous crimes will continue to walk free through Kenya. I do not like the option of the ICC, but unless Kenya begins to look for other ways to move the trial out of country problems will remain. Kenya and the International Criminal Court have agreed on a new deadline to set up a special tribunal to try the ringleaders of post-election violence. Kenyan ministers promised to establish the tribunal by July 2010 and in the meantime provide the ICC with the details of their investigations. An ICC spokesman said ministers also promised to refer the case to the ICC if they failed to establish a tribunal. About 1,500 people were killed in violence following the 2007 elections. Chief mediator Kofi Annan had warned the Kenyan government he would hand over a list of suspects to the ICC if Nairobi failed to form the tribunal before the end of August 2009. Mr Annan, the former UN secretary-general, brokered a power-sharing deal last year to end the violence. ICC chief prosecutor Luis Moreno Ocampo told the BBC he was satisfied with the new agreement. "They will do the case themselves or, if they don't do that, they will refer the case to me," he said. 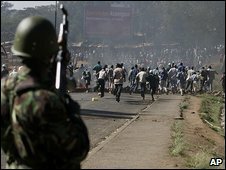 Rioting erupted after President Mwai Kibaki was declared the winner of the December 2007 presidential poll, triggering claims of electoral fraud from the then opposition leader Raila Odinga. The rivals signed a power-sharing deal in February 2008 to end to the violence and formed a coalition government - but not before 1,500 people died in clashes and another 300,000 fled their homes. Also last month, Amnesty International accused the Kenyan government of having done nothing to end the impunity for "widespread and serious human rights violations committed by the police and security forces" after the election.